There is, of course, a story behind this lectern. I was returning one afternoon from classes at the University of Washington, pedaling along 25th Street NE on my ten speed Peugeout when I decided to stop at an antique store that had recently opened. It was called Pelayo Antiques and while not looking for searching in particular, it was fun to just look around and see what was inside. Besides, I needed to rest for a few minutes; there were a lot of steep hills near the University. Wooden tables, chests, trunks, benches, and stained glass windows filled the store. Wrought iron plant stands, tin lanterns, and a few paintings were scattered in between the tables and chairs. 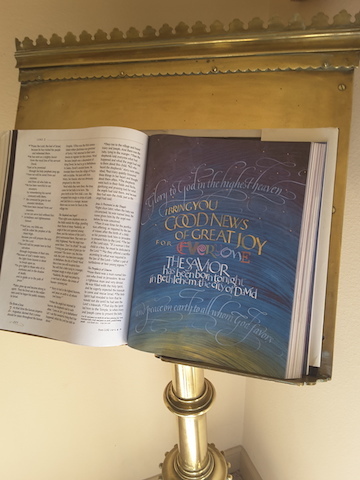 In the corner of a room a tarnished brass lectern caught my attention. Standing nearly six feet tall, its simple design was not as ornate as the ones that are found in the great cathedrals throughout Europe. 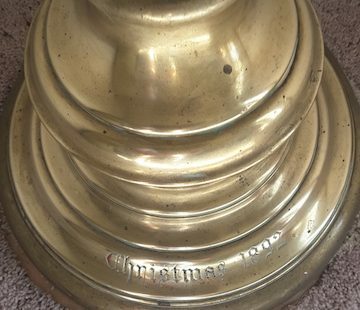 Its tarnished base revealed a barely readable inscription, Christmas 1892. I thought about it all the way home. store in Seattle in 1973. Through his European contacts he began importing antiques from England, Spain, Scandinavia, and Scotland. During the 1970’s declining church attendance and a failing Scottish economy caused many churches to sell pews, windows, reading desks, candle holders, wooden lecterns, altars, and art. The lectern was included in a cargo lot of antiques he had purchased on a buying trip to Scotland. remodeling a home in one of the most exclusive real estate markets in Seattle,Bainbridge Island. She intended to use it in the kitchen as a cook book stand. Several months went by and I had forgotten about the lectern. In the meantime we were expecting our first child, and one afternoon, looking in a consignment store for a crib, decided to stop in and say hello to Pelayo. To my surprise, the lectern had been returned and stood once again in the corner. dollars on me, the money for a crib. But I made the decision to bring the lectern home instead. later, the crib is gone but we still have the lectern. In 1999, on a visit to Seattle for the first time in twenty-five years, while taking a walk through an old neighborhood I came across Pelayo Antiques in a new location. I went inside and looked for Pelayo. I found him working on some furniture in a back room. He didn’t didn’t recognize me at first and asked if I was looking for anything in particular. “Pelayo,” I smiled as I said to him, “You sold it to me. I still have it and have taken care of it.” He stepped around from the table and gave me a huge hug. largest and premiere importers of European antiques. Pelayo would close his store in 2006.
color begins to shine, I am reminded of the artistry and craftsmanship of its makers. From a church congregation in Scotland to Pelayo Antiques and now to me, I continue to be the caretaker of this 124-year old lectern, and its story. David is a graduate of the University of Washington (BA,MA) and Oregon State University (Ph.D). His interests include astronomy, photography, painting, and baseball. He never travels without his guitar and banjo. He is a veteran, USCG. Contact the author.